A few months ago SimGuruDrake left her role as a Community Manager for The Sims to pursue a new opportunity as a CM for another game. Since then EA has put up a job application form, allowing people to apply for the Community Manager rule. 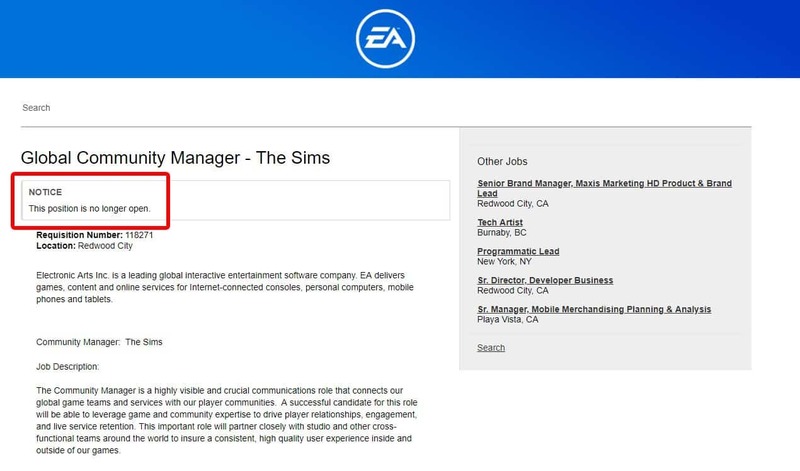 After 3 months, Electronic Arts has finally found its Community Manager for The Sims. EA’s career page for the Global Community Manager for The Sims now tells that the position to apply is no longer open. We’ve done a double check with our source at EA and we can confirm that the search for a new CM has truly ended. Currently we have no information on who it is or when will the new CM for The Sims be announced, but we’re definitely glad that The Sims for PC is finally going to have its public voice once again.